Nawanshahr: Carrying placards with photos of martyrs and books referred to by the Sessions Judge Nawan Shahr in the recent judgement against three Sikh youth namely Arvinder Singh, Surjit Singh and Ranjit Singh, Dal Khalsa activists marched to the district courts taunting the administration and daring the state to take action against them. 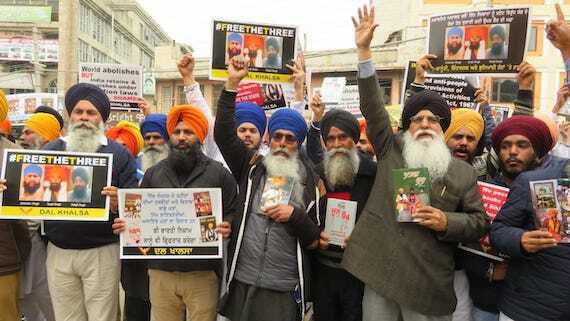 Waving the books to the protesters, the leaders called the martyrs as Sikh heroes, whose books adorn their homes. Crushing the already-reduced space for dissent and upholding a different religio-political opinion, especially the right to self-determination, the order of Randhir Verma – the Additional Sessions Judge of SBS Nagar court sentencing three youth to the maximum punishment of life imprisonment for mere possession of posters and literature relating to the Sikh struggle, is an annulment of the freedom of expression and portrays a clear enemy-like attitude towards the Sikhs, said Dal Khalsa leader H S Dhami in a statement released during their protest sit-in here today. 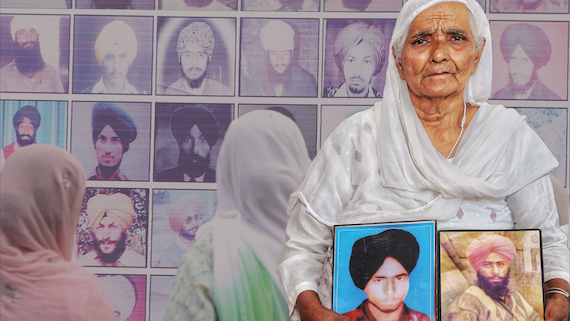 Mother of one of the convict Arvinder Singh participated in the sit-in. 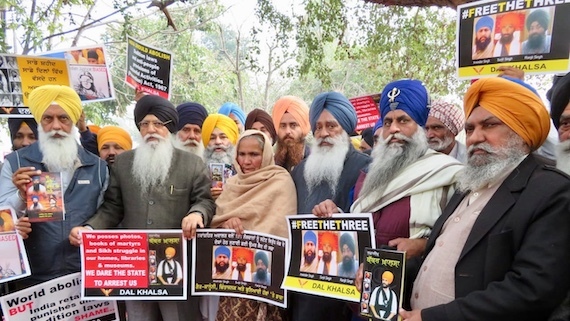 Accompanied by Prof Mohinder Pal Singh, General Secretary of Shiromani Akali Dal (Amritsar), SGPC members Karnail Singh Panjoli and Panthic front leader Sukhdev Singh Bhaur, Dal Khalsa veteran leader Dhami said the order is a clear-cut case of how the judiciary has exceeded its brief to take on the role of the executive and how the executive has taken swift action to buttress the defaults of the judiciary. ‘It is nothing but judicial terror and political repression’, said he. 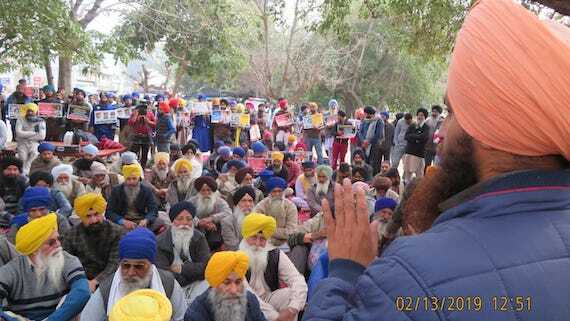 Addressing the spirited gathering outside court premises, Dhami said it was amusingly shocking to note that as a result of the overwhelming objections and denouncements of the judgement for ‘waging war’ by political activists and civil society, the police under instructions of the present Punjab government acted post-facto to foist another case against one of the accused to ‘build the case’ against the accused. ‘This proves that the judiciary, the executive and the police are hand-in-glove,’ said he while addressing the dharna. “There was no conspiracy to overthrow the government, there was no evidence of any incitement upon reading the books, there was no proof that the accused actually read all the books that they possessed, there was no communication with any one through social media or otherwise which can come into the purview of criminal activity. They were all acquitted under the Unlawful Activities Prevention Act, thus proving that they were not members of any proscribed organisation. 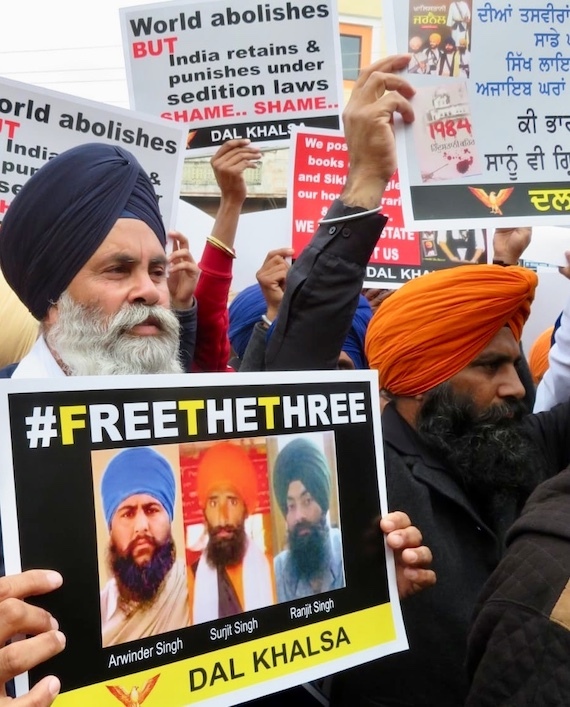 The accused did not hold any secret or public meetings to incite any individual or group to wage a war against the government of India”, said Dhami and added that the entire case is a frame-up to crush dissenting voices. 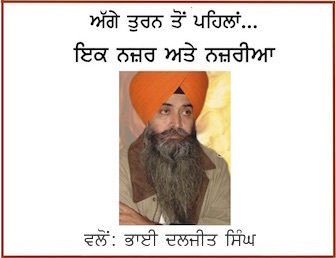 Speaking on the occasion Panjoli said “The allegation is that 97 books, 198 photographs and 13 photographs of Sikhs, who had died in the Saka of 1978 and 1000 books in connection with biography of Sukhdev Singh Babbar were recovered from him.” None of this is a crime and none of this has been proscribed by the government. SYP head Paramjit Singh Mand said, ‘the judge has moved from action pursuant to a conspiracy to mind reading. The judge’s focus is ‘mensrea –the guilty mind.’ No intent or action is mentioned or proved.